Your contract for purchases made through the Site is with The Bookyard, and you undertake that any and all goods ordered by you are for your own private and domestic use only. No contract for the sale of any product will subsist between you and The Bookyard until The Bookyard dispatches the product(s) ordered. We will confirm that the product(s) have been dispatched by a confirmation email. This confirmation e-mail amounts to an acceptance by The Bookyard of your offer to buy goods from The Bookyard or a third party supplier that is engaged on your behalf by The Bookyard (whether or not you receive that e-mail). You undertake that all details you provide to The Bookyard for the purpose of ordering or purchasing goods or services are correct, that the credit or debit card you are using is your own and that there are sufficient funds to cover the cost of the goods or services ordered. If there are any changes to the details supplied by you it is your responsibility to inform The Bookyard as soon as possible. where you have already received the goods, returning the goods to The Bookyard unopened together with the original invoice. The Bookyard will refund you the purchase price of the goods. Unless the order was cancelled due to an error by The Bookyard, The Bookyard shall not refund any shipping costs or additional customs duties borne by you. Once The Bookyard receive notification from you that you wish to withdraw from the contract (in accordance with these terms), the relevant part of any sum debited to The Bookyard from your credit card in relation to your order will be re-credited to that credit card account as soon as possible and in any event within 30 days of your order provided that the goods you wish to return are received by The Bookyard in the condition that they were in when delivered to you. You will be liable for any charges incurred in returning the goods to The Bookyard. Where the customer orders a part or parts in error, The Bookyard reserves the right to make a 15% or £10 (whichever is greater) restocking charge for returned used components that have been opened. Upon receipt of returned goods, a refund of the original purchase price of the part minus the restocking fee will be made to the customer. The Bookyard reserves the right to refuse to accept the return of new products which the customer purchased in error and which have been opened. The Bookyard also reserves the right to make a charge for collecting goods from your premises in circumstances where they are not defective but you have cancelled your order. Your statutory rights are not affected. This section applies only to the extent permitted by law. For the avoidance of doubt, The Bookyard do not exclude or limit any liability for (a) personal injury (including sickness and death) where such injury results from The Bookyard’s negligence or wilful default, or that of The Bookyard´s employees, agents or subcontractors or (b) fraudulent misrepresentation. The Bookyard does not accept liability (except as set out below) for any errors and omissions and reserve the right to change information, prices, specifications and descriptions of listed goods, products and services. The Bookyard will do its best to correct errors and omissions as quickly as practicable after being notified of them. TO THE FULLEST EXTENT PERMITTED BY LAW, THE BOOKYARD IS PROVIDING THIS SITE AND ITS CONTENTS ON AN ‘AS IS’ BASIS AND MAKES NO (AND EXPRESSLY DISCLAIMS ALL) REPRESENTATIONS OR WARRANTIES OF ANY KIND, EXPRESS OR IMPLIED, WITH RESPECT TO THIS SITE OR THE INFORMATION, CONTENT, MATERIALS OR PRODUCTS INCLUDED IN THIS SITE INCLUDING, WITHOUT LIMITATION, WARRANTIES OF MERCHANTABILITY AND FITNESS FOR A PARTICULAR PURPOSE. IN ADDITION, The Bookyard DOES NOT REPRESENT OR WARRANT THAT THE INFORMATION ACCESSIBLE VIA THIS SITE IS ACCURATE, COMPLETE OR CURRENT. In the unlikely event that you receive goods which were not what you ordered or which are damaged or defective, or are of a different quantity to that stated on your order form, The Bookyard shall, at its own option, make good any shortage or non-delivery, replace or repair any damaged or defective goods, or refund to you the amount you paid for the goods in question PROVIDED THAT you notify The Bookyard of the problem in writing at the address stated in the confirmation e-mail within 10 working days of delivery of the goods. NOTHING IN THIS CLAUSE AFFECTS YOUR STATUTORY RIGHTS. You and The Bookyard will only be liable under these Terms for losses which are a reasonably foreseeable consequence of the relevant breach of contract. The products sold on the Site are provided for private domestic and consumer use only. Accordingly, The Bookyard do not accept liability for any indirect loss, consequential loss, loss of data, loss of income or profit, loss of damage to property and/or loss from claims of third parties arising out of the use of the Site or for any products or services purchased from The Bookyard. All electrical products are covered by a twelve month manufacturer´s warranty. If your product develops a fault while under warranty, please contact The Bookyard and we will advise you where to send it for repair. It is a "return to base" warranty therefore there will be a delivery charge to return the product back to the relevant UK service centre. 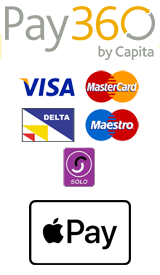 Credit and Debit cards are debited at the time the order is placed with the store. Credit and debit card details are entered on our payment gateway provider's secure payment page and are not known to The Bookyard. All prices include sales taxes (where applicable) unless otherwise stated. Every purchase you make shall be deemed performed in the United kingdom. The laws of England shall govern every aspect of contractual agreement concerning purchases made from the Site. The Bookyard aims to arrange shipment of all ‘in stock’ items within 1 working days of receiving your order. Your order may be delayed if the item is not in stock with our suppliers. Some items may be unavailable and the current stock status is approximate. The Bookyard are not able to supply dates by which our suppliers may get an item in stock. You can keep track of your order status yourself on-line with the order tracking facility on your account page. Our standard Returns Policy applies to all purchases from The Bookyard. Title to any product ordered will pass to you once The Bookyard has received payment in full for that product. Risk in any product ordered will pass upon delivery to you. If your delivery address is outside of the United Kingdom, you may be subject to import duties and taxes, which are levied once a shipment reaches your country. Any such additional charges for customs clearance must be borne by you. You should note that customs policies vary widely from country to country; The Bookyard advises each customer to contact their local customs office for further information. Subject to the licence granted to you to use the Site, The Bookyard reserves all rights, title and interest in its Intellectual Property Rights in the Site. Any goodwill accruing from use of The Bookyard and its affiliates’ trade marks, trade and business names and service marks under this Agreement will vest in The Bookyard and its affiliates, as appropriate. It is a crime to use a false name or a known invalid credit card to order. Anyone caught wilfully entering an erroneous or fictitious order will be prosecuted to the fullest extent of the law. The Bookyard tracks the electronic ‘fingerprints’ of every order placed on The Bookyard to enable us and all legitimate crime prevention and prosecution authorities to trace individual users engaging in criminal activities on our website. The Bookyard may amend these Terms from time to time, and place the new version on the Site. When The Bookyard do so, it will mention the fact on our home page (www.thebookyard.com). For users purchasing goods or registering on the Site for the first time, all purchases from the date that the amended terms are placed on our website onwards will be governed by those new terms Otherwise, such changes will be effective against existing users thirty days following posting of the amended version on the Site. Your continued use of the Site following The Bookyard’s posting of any changes will constitute your acceptance of such changes. If you do not agree to any changes to these Terms, then your only remedy is to cease using the Site. These Terms supersede any and all other conditions, understandings, commitments, agreements or representations (except fraudulent misrepresentations) relating to your purchase, whether oral or in writing, and contain the entire agreement between The Bookyard and you relating to your purchase. The Bookyard advises that you print off and keep safe a copy of these terms and conditions once your order has been accepted by The Bookyard. We will store a copy of the contract entered into by you with The Bookyard. You are advised to read (and are responsible for reading) fully all information on this website. These Terms are subject to the laws and exclusive jurisdiction of England.